By combining a world-class team of specialists with a full range of standard and innovative therapies, Montefiore can offer liver transplant patients a survival rate of more than 90 percent—significantly higher than the national average of 75-80 percent. Additionally, we have performed multiple combined organ transplantations. Rates of subclinical and overt liver disease—particularly hepatitis C infection—are rising in this country. The hepatitis C virus (HCV) is the most common cause of end-stage liver disease (ESLD) in the Western world today. While new infections are expected to decrease over the next five to 10 years, the number of HCV-infected patients with cirrhosis and end-stage liver disease will increase dramatically. In addition, the epidemic of obesity and diabetes will likely increase the number of patients with non-alcoholic fatty liver disease (NAFLD) in the United States. Chronic conditions that damage the liver can eventually lead to ESLD, which is incurable without liver replacement. 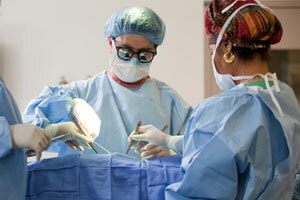 At any time, approximately 16,600 adults and children in the United States are awaiting liver transplantation. According to the Organ Procurement and Transplantation Network, in 2009 only about 6,000 patients in the entire country received a liver transplant, and 426 of those transplants were performed in New York. New York State has one of the highest rates of liver disease in the United States, with more than 1,800 patients in the state waiting for a donor liver. However, only 300 to 350 donor livers become available in New York every year, illustrating an alarming gap between need and access to lifesaving transplants. The first liver transplant was successfully performed in a critically ill woman with fulminant hepatic failure in 2008. Within the first year of the Liver Disease and Transplantation Program, 50 patients were on the waiting list. Within the past two years, 34 patients, including two infants, have received liver transplants with a survival rate of more than 95 percent. Of the 34 transplant recipients, 15 percent had acute liver failure, UNOS status 1. The median natural MELD for all the other recipients was over 30. About 25 percent of the transplant recipients had unresectable liver cancer. As of 2011, all are alive and well, with no sign of cancer recurrence. In 2010, Montefiore performed a "split liver" graft, in which an adult donor liver was split in the donor and offered to two recipients. Montefiore was approved to initiate its live donor liver program in 2010. In 2008, Millicent P. received the first liver transplant at Montefiore. The 51-year-old Bronx native had presented with acute liver failure of unclear etiology, which rapidly progressed to coma, requiring urgent transfer and listing for liver transplantation. Montefiore Einstein's Rapid Response Team for liver failure, which includes specialists in critical care, medicine, hepatology, liver transplant anesthesia and transplant surgery, was mobilized. The patient was made hypothermic and had placement of an intracranial pressure monitor, transcranial Doppler monitoring and renal replacement with continuous veno-venous hemofiltration (CVVH). A donor liver became available less than 24 hours later and the diseased liver was replaced. Within another 24 hours, the patient regained consciousness and was discharged eight days postoperatively with normal functional status and no neurological deficits. Juan F. underwent a combined heart/liver transplant at Montefiore in 2010. Only a handful of such procedures have been performed worldwide for his unique condition: heterozygous familiar hypercholesterolemia, an inherited metabolic condition causing irreversible atherosclerotic heart disease. Juan had failed maximal medical therapy and plasmapheresis to reduce lipid loads. Because replacing the heart without correcting the underlying enzyme defect would have accelerated a recurrence of ischemic cardiomyopathy, Juan was offered a heart and liver from the same donor. The successful operation was performed in 12 hours by two surgical teams, one for the heart and one for the liver. Ten days later, the 32-year-old patient was discharged and went home.